The first time I ever visited Disney World was on my honeymoon. From the moment I stepped into the Magic Kingdom I was in love and not just with my new husband. I was in awe with all the visual splendor Disney has to offer. That was back in the Fall of 1994 and over the years we have been back many times. 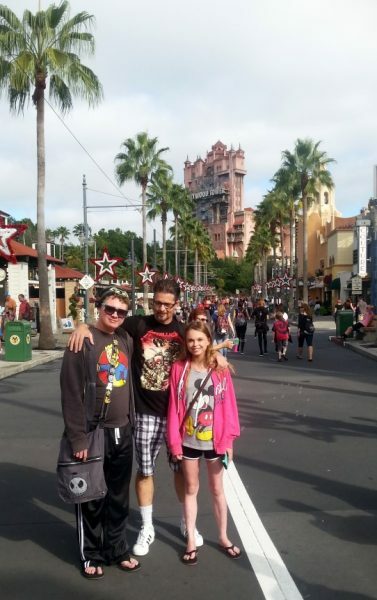 Our children have grown up making memories of countless trips to Disney World. Coincidentally, 1994 was also the year Disney unveiled a new thrill ride, The Twilight Zone Tower Of Terror in their Hollywood Studios Park. 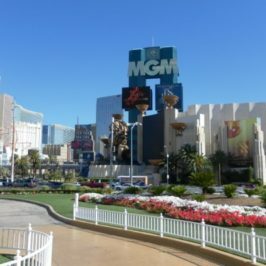 (Back then the park’s name was Disney MGM Studios and I still find myself slipping up and calling it MGM at times.) This ride sits in my top three All Time Favorite Rides in all of Disney. First of all, I love Disney’s Hollywood studios as it is focused on the film industry. This park is full of charm and eye candy. I have always been a fan of the classic series Twilight Zone, vintage horror movies and have a strong interest in the paranormal. The spooky Twilight Zone Tower Of Terror is right up my alley! Disney’s Imagineers never cease to amaze me at the creativity and visual details that is put into each one of their attractions. They always try to tell a story from the time you enter the line and I think The Tower of Terror is perhaps the best example of this. The props and scenery are just amazing. 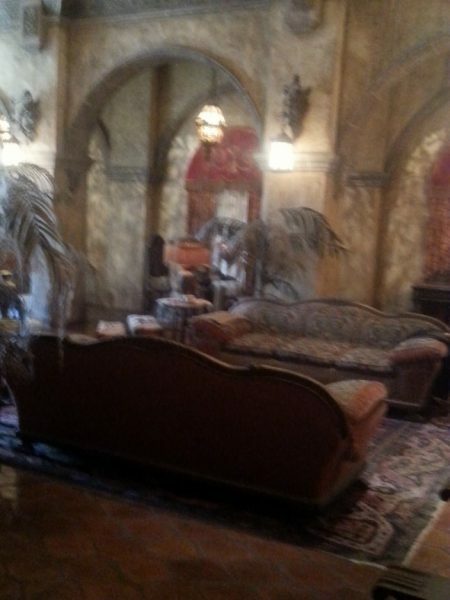 They have you immersed in the story line from the time you enter the gates to the time you exit the hotel’s basement. In a nutshell, the story of the Twilight Zone Tower of Terror begins on Halloween night in 1939. 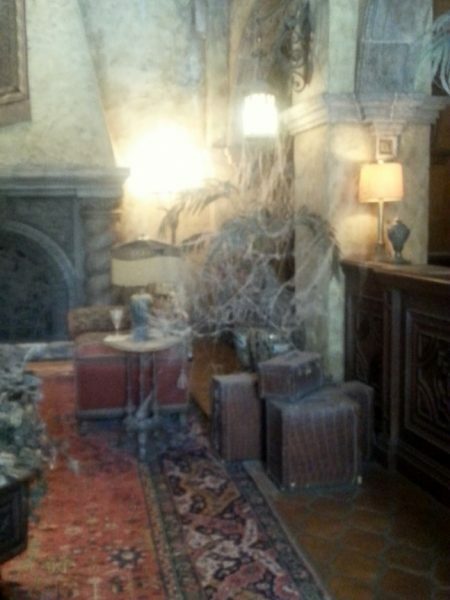 The elegant, bustling Hollywood Tower Hotel is hit by lightning during a horrible stormy night resulting in an entire wing and guests to vanish and the elevators to drop and crash. The hotel was “closed” thereafter. Modern day guests are lead through the lobby, into a library and into a very dark and creepy boiler room where they board a service elevator. That’s where the thrills, chills and terror begins! 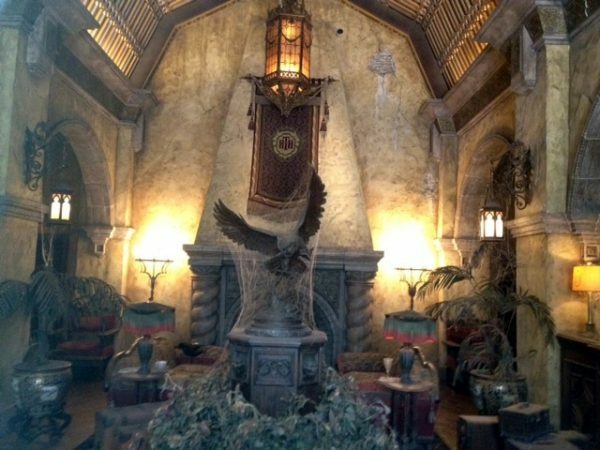 You begin your journey into the Tower of Terror by walking up winding paths through the once formal garden and enter the lobby of the hotel. With Halloween around the corner I thought it would be fun to take a tour of this amazingly spooky main lobby. 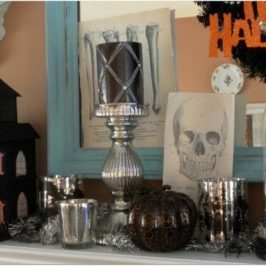 You may even get a few Halloween decorating ideas to boot! As vintage jazz music from the 1930’s faintly wafts through the air, you will see a once elegant hotel lobby now abandoned and draped in layers of dust and cobwebs. Wonder how they get the look of those authentic looking cobwebs? 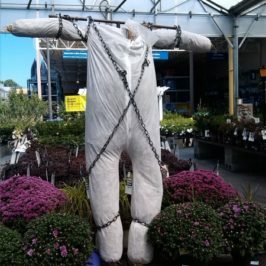 They are actually created out of hot glue strings they dry at high speed. They are changed every 8 months or so. Some of the sculptures like the enormous owl in the lobby were created by 19th century sculptor Auguste Moreau. 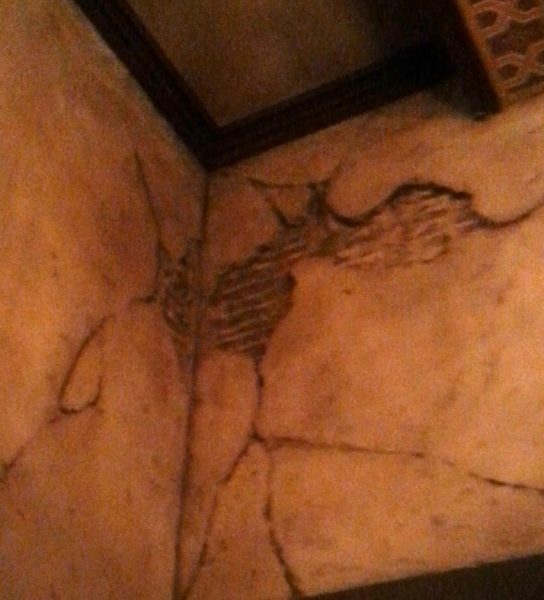 The walls are “cracked” to look like this place has long been forgotten. 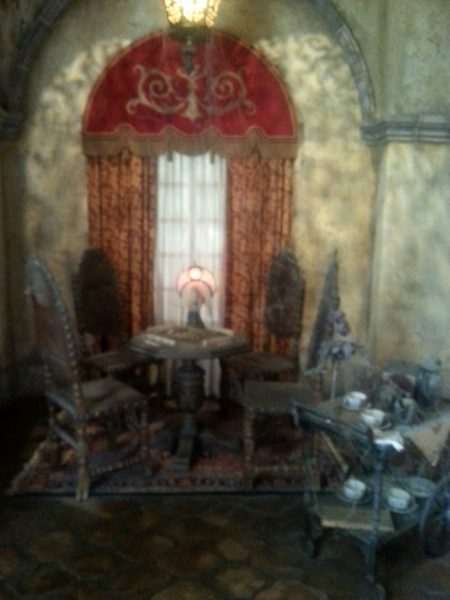 Disney decorators filled the lobby with period antiques and furniture purchased at auction houses in the Los Angeles area. The attention to detail in Disney’s decorating is exquisite. What an awesome job to have! I would have loved to have worked on a project like this one. 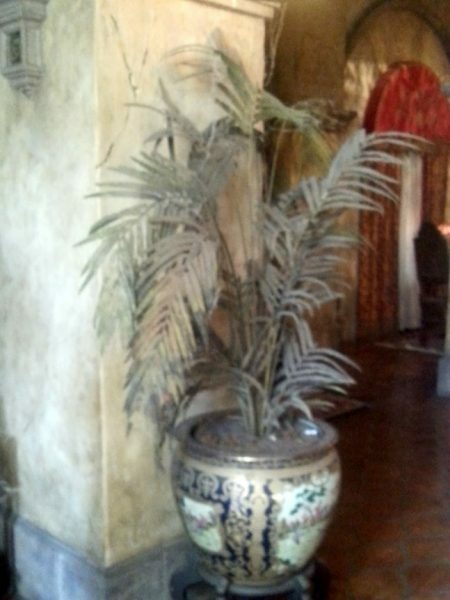 There are a few dust laden potted plants scattered about that add to the look and feel of the Tower’s main lobby. Elegant draperies, a tea tray and a table set with an unfinished game of Majhong sits in one area of the lobby. A cozy nook to have tea and a game of Mahjong with a friendly ghost or two. Unread messages and letters fill the antique hotel mail and key cabinet…. 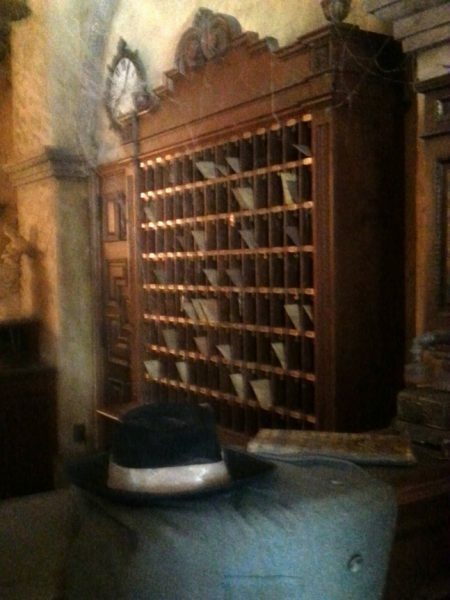 I love the extensive use of props used throughout the Twilight Zone Tower Of Terror like the ones featured at the old concierge desk. 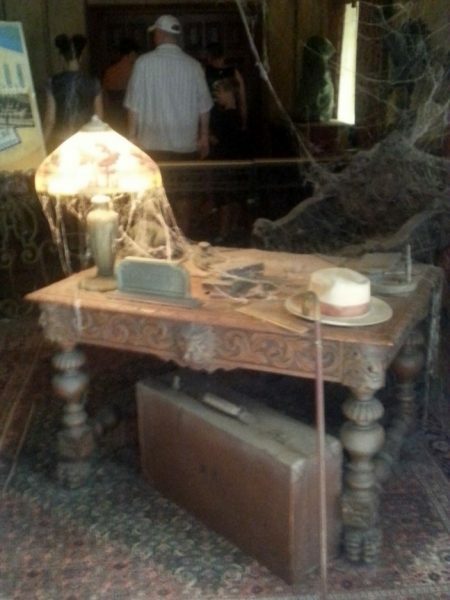 It looks as though a long ago guest just up and left…or vanished on that terrible night in 1939. The main lobby is only one example of the incredible details that adorn the Twilight Zone Tower of Terror in Disney’s Hollywood Studios. The library, basement and boiler room are equally amazing. Not only are they filled with antiques and relics of the past but there are many props and references of the classic TV show scattered throughout the building. If you are not a thrill seeker I would suggest taking a walk through the line anyway. There is so much to see and many details to enjoy and there is an escape route just before you get on the elevator for those with wobbly knees. 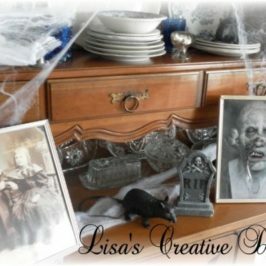 Want to create your own haunted hotel or haunted house for a Halloween party? 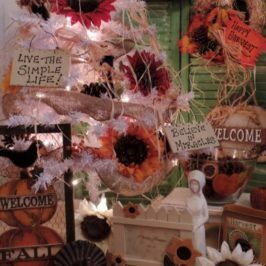 You can take some of these ideas and create your own version with the use of props found in your own attic. Grandma’s house or picked up at thrift stores. 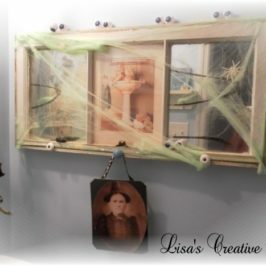 I found a few ways to make your own creepy cobwebs that look pretty cool. You can check them out here and here.